Today, the Half Cent Coin remembers the British invasion of Washington and their evening exodus on August 25, 1814. From The War of 1812, by Gilbert Auchinleck, published in 1852, a letter written by British General Robert Ross details their taking of our capitol city 202 years ago. From Major-general Ross to Earl Bathurst. Tonnant, in the Patuxent, Aug. 30, 1814. I have the honor to communicate to your lordship, that on the 24th instant, after defeating the army of the United States on that day, the troops under my command entered and took possession of the city of Washington. It was determined between Sir Alexander Cochrane and myself, to disembark the army at the village of Benedict, on the right bank of the Patuxent, with the intention of co-operating with rear-admiral Cockburn, in an attack upon a flotilla of the enemy’s gun-boats, under the command of commodore Barney. On the 20th instant, the army commenced its march, having landed the previous day without opposition; on the 21st it reached Nottingham, and on the 22d moved on to Upper Marlborough, a few miles distant from Pig point, on the Patuxent, where admiral Cockburn fell in with, and defeated the flotilla, taking and destroying the whole. Having advanced within 16 miles of Washington, and ascertained the force of the enemy to be such as might authorize an attempt at carrying his capital, I determined to make it, and accordingly put the troops in movement on the evening of the 23rd. A corps of about 1200 men appeared to oppose us, but retired after firing a few shots. On the 24th, the troops resumed their march, and reached Bladensburg, a village situate on the left bank of the eastern branch of the Potomac, about five miles from Washington. On the opposite side of that river, the enemy was discovered strongly posted on very commanding heights, formed in two lines, his advance occupying a fortified house, which, with artillery, covered the bridge over the eastern branch, which the British had to pass. A broad and straight road leading from the bridge to Washington, ran through the enemy’s position, which was carefully defended by artillery and riflemen. The disposition for the attack being made, it was commenced with so much impetuosity by the light brigade, consisting of the 85th light infantry, and the light infantry companies of the army under the command of colonel Thornton, that the fortified house was shortly carried, the enemy retiring to the higher grounds. In support of the light brigade, I ordered up a brigade under the command of colonel Brooke, who, with the 44th regiment, attacked the enemy’s left, the 4th regiment pressing his right with such effect, as to cause him to abandon his guns. His first line giving way, was driven on the second, which, yielding to the irresistible attack of the bayonet, and the well-directed discharge of rockets, got into confusion and fled, leaving the British masters of the field. The rapid flight of the enemy, and his knowledge of the country, precluded the possibility of many prisoners being taken, more particularly as the troops had, during the day, undergone considerable fatigue. The enemy’s army, amounting to 8 or 9000 men, with 3 or 400 cavalry, was under the command of General Winder, being formed of troops drawn from Baltimore and Pennsylvania. His artillery, 10 pieces of which fell into our hands, was commanded by commodore Barney, who was wounded and taken prisoner. The artillery I directed to be destroyed. Having halted the army for a short time, I determined to march upon Washington, and reached that city at eight o’clock that night. Judging it of consequence to complete the destruction of the public buildings with the least possible delay, so that the army might retire without loss of time, the following buildings were set fire to and consumed, — the capitol, including the Senate-house and House of Representatives, the Arsenal, the Dock-yard, Treasury, War-office, President’s Palace, Ropewalk, and the great bridge across the Potomac; in the dock-yard a frigate nearly ready to be launched, and a sloop of war, were consumed. The two bridges leading to Washington over the eastern branch had been destroyed by the enemy, who apprehended an attack from that quarter. On the evening of the 29th we reached Benedict, and re-embarked the following day. In the performance of the operation I have detailed, it is with the utmost satisfaction I observe to your lordship, that cheerfulness in undergoing fatigue, and anxiety for the accomplishment of the object, were conspicuous in all ranks. To Sir A. Cochrane my thanks are due, for his ready compliance with every wish connected with the welfare of the troops and the success of the expedition. To rear-admiral Cockburn, who suggested the attack upon Washington, and who accompanied the army, I confess the greatest obligation for his cordial co-operation and advice. Colonel Thornton, who led the attack, is entitled to every praise for the noble example he set, which was so well followed by lieutenant-colonel Wood and the 85th light infantry, and by major Jones, of the 4th foot, with the companies attached to the light brigade. I have to express my approbation of the spirited conduct of colonel Brooke, and of his brigade, the 44th regiment, which he led, distinguished itself under the command of lieutenant-colonel-Mullens; the gallantry of the 4th foot, under the command of major France, being equally conspicuous. The exertions of captain Mitchel, of the royal artillery, bringing the guns in to action, were unremitting; to him, and to the detachment under his command, including captain Deacon’s rocket brigade, and the marine rocket corps, I feel every obligation, Captain Lempriero, of the royal artillery, mounted a small detachment of the artillery drivers, which proved of great utility. The assistance afforded by captain Blanchard, of the royal engineers, in the duties of his department, was of great advantage. To the zealous exertions of captain Wainwright, Palmer, and Money, of the royal navy, and to those of the officers and seamen who landed with them, the service is highly indebted, the latter, captain Money, had charge of the seamen attached to marine artillery. To captain McDougall, of the 85th foot, who acted as my aide de camp, captain Falls, and to the officers of my staff, I feel much indebted. I must beg leave to call your lordship’s attention to the zeal and indefatigable exertions of lieutenant Evans, acting deputy quarter-master-general. The intelligence displayed by that officer, in circumstances of considerable difficulty, induces me to hope he will meet with some distinguished mark of approbation. I have reason to be satisfied with the arrangements of assistant-commissary-General Lawrence. An attack upon an enemy so strongly posted, could not be effected without loss. I have to lament that the wounds received by colonel Thornton, and the other officers and soldiers left at Bladensburg, were such as prevented their removal. As many of the wounded as could be brought off were removed, the others being left with medical care and attendants. The arrangements made by staff surgeon Baxter for their accommodation, have been as satisfactory as circumstances would admit of. The agent for British prisoners of war very fortunately residing at Bladensburg, I have recommended the wounded officers and men to his particular attention, and trust to his being able to effect their exchange when sufficiently recovered. Captain Smith, adjutant-general to the troops, who will have the honor to deliver this dispatch, I beg leave to recommend to your lordship’s protection, as an officer of much merit and great promise, and capable of affording any further information that may be requisite. Sanguine in hoping for the approbation of his royal highness the prince regent, and of his majesty’s government, as to the conduct of the troops under my command, I have, &c.
I beg leave to enclose herewith a return of the killed,* wounded, and missing in the action of the 24th instant, together with a statement of the ordnance, ammunition, and ordnance stores taken from the enemy between the 19th and 25th of August and likewise sketches of the scene of action and of the line of march. * Killed 64 ; wounded 138. Return of ordnance, ammunition, and ordnance-stores, taken from the enemy by the army under the command of Major-General Robert Ross, between the 19th and 25th of August, 1814. August 19 — 1 24-pound carronade. August 22. — 1 6-pound field-gun, with carriage complete; 156 stand of arms, with cartouches, &c. &c.
August 24, at Bladensburg. — 2 18-pounders, 5 12-pounders, 3 6-pounders, with field-carriages; a quantity of ammunition for the above; 220 stand of arms. August 25, at Washington. — Brass : 6 18-pounders, mounted on traversing platforms; 5 12-pounders, 4 4-pounders, 1 5 1/2 inch howitzer, 1 5 1/2 inch mortar. Iron: 26 32-pounders, 36 24-poumlers, 34 18-pounders, 27 12-pounders, 2 18-poumlers, mounted on traversing plat forms; 19 12-pounders, on ship-carriages; 3 13-inch mortars, 2 8-inch howitzers, 1 24-pound gun, 5 32-pound carronades, 5 18-pound carronades, 13 12-pound guns, 2 9-pound guns, 2 6- pound guns. Total amount of cannon taken — 206; 500 barrels of powder; 100,000 rounds of musket-ball cartridges; 40 barrels of fine-grained powder; a large quantity of ammunition of different natures made up. The navy-yard and arsenal having been set on fire by the enemy before they retired, an immense quantity of stores of every description was destroyed; of which no account could be taken. Seven or eight very heavy explosions during the night denoted that there had been large magazines of powder. F. G. J. WILLIAMS, lieutenant royal artillery, A. Q. M.
J. MICHELL, captain commanding artillery. N.B. The remains of near 2000 stand of arms were discovered which had been destroyed by the enemy. 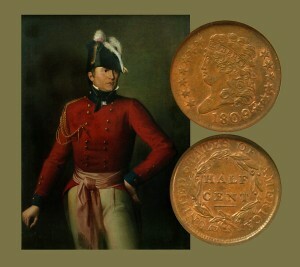 The Half Cent Coin shows with an artist’s portrait of General Robert Ross.